The entry area became an 'urban mudroom' with ample storage and a small clean workspace that can also serve as an additional sleeping area if needed. 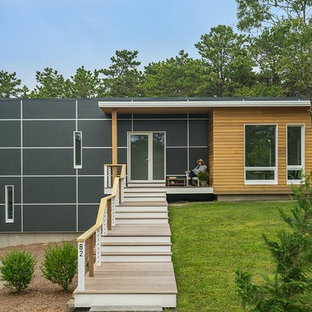 Glass block borrows natural light from the abutting corridor while maintaining privacy. Photos by Eric Roth. Construction by Ralph S. Osmond Company. 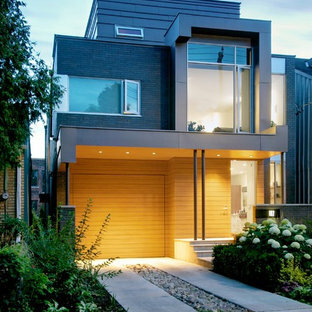 Green architecture by ZeroEnergy Design. Laguna Beach, California Custom Home: New smooth stucco on all exterior walls, including low walls at the downhill entry area, highlight the contemporary, planar elements of this unique entry design. 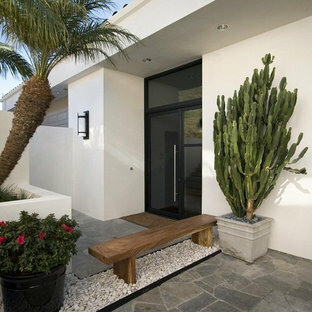 Custom metal window and door systems enhance the minimalist aesthetic, while a natural wood bench in a bed of tumbled white stones softens the entry area and invites visitors to rest and gather. 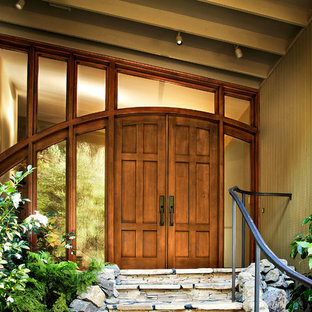 Six panel pair Clear Alder contemporary solid wood entry door, with German New Antique IG glass. 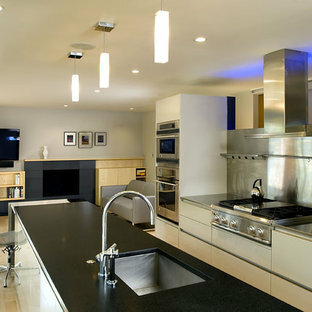 An extensive Remodel of of an existing 1,500 square foot Flat, resulting in an open expansive Kitchen, Dining and Entry. Three large skylights and expansive windows were introduced into the main open space, creating a significantly brightened interior. 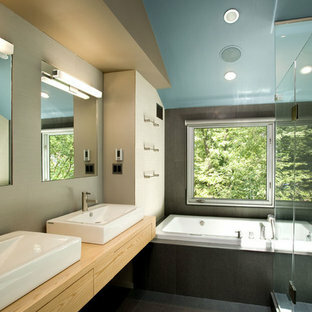 Clean, Modern Design is emphasized. The main space now spans the length of the building, over 60 feet. The New Open Kitchen, Dining and Entry was created from an existing dark and underutilized Hallway. The new space includes a reconfigured Living Room, Bedroom, Master Bedroom and Bath, 2 Bedrooms, and the open main Kitchen, Dining and Entry. 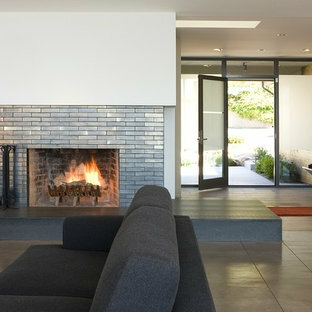 The Bright, Clean, Modern Design also creates a galleried space for Modern Art and Furnishings.